Expanded format is the new Black. Now that several regional events are in the Expanded Format, the format is growing and gaining in popularity. Our local League has always been in Expanded Format as it allows a wider variety of deck to be used. Additionally since the ‘Nightmarsh’ deck doesn’t utilise Tapu Lele-GX it is extremely affordable and competitive at the same time! This post has a short overview of some Expanded deck archetypes – although we’re going to look at the winning deck from the latest US Expanded regional (Fort Wayne) and then a re-hash of 2 expanded deck archetypes combined into one! Nightmarsh is similar to the typical Night March decks that dominated Standard Format in 2015-16. In Worlds that year it was defeated by the mighty Audino-EX but that is another story! Put simply Night March is an attack that gets more powerful depending on the number of Pokémon with the ‘Night March’ attack in your discard pile. Decks focus on having one or two attackers (usually Joltik or a Mew) and put the rest of the Night Marchers into the discard pile. This enables them to have a high damage attack for a low energy cost. It is similar to Vespiquen/Flareon decks (aka ‘Bees’) although the main attacker is usually much more fragile. Joltik has 30HP, Mew a mere 50HP – The solution to this is Marshadow-GX! Marshadow-GX is a Fighting type Pokémon that can copy any basic attack from a Pokémon in the discard pile via its ability ‘Shadow Hunt’. This synergises with Night March Pokémon as you want them to be in the discard pile. Voila instant improvement of the deck! The most difficult components to acquire is the Computer Search or Dowsing Machine – these are ‘Ace Spec.’ meaning you can only have one or the other in your deck. They are relatively expensive but thankfully you can only have, and so ever only need, one! Shaymin-Ex has dropped in price since it’s not in the Standard Format any more. In this deck it works to draw you cards. You need to be able to keep drawing since you have to discard so much out of your deck with Battle Compressor. The Charizard Lounge has a great article on how to run this deck with a very similar list to the above and also the winning Fort Wayne Regional list. It is a high skill level deck because you need to fine-tune the amount of Pokémon in your discard pile (and therefore your damage output) with your need for Pokémon on the bench to be able to attack with. Raikou/Eels is an existing archetype that basically involves using Eelektrik to rapidly accelerate energy onto an efficient recipient, namely Raikou. Raikou is a great Pokémon, especially when equipped with a Fighting Fury Belt. It also resists all damage when it has at least one Lighting Energy attached. It’s attack scales with the amount of energy attached so it can hit for high numbers and only concedes one prize when KOed. To add to the mix, Rough Seas will heal 30 damage every turn. For example if you’re attacked for 60 damage, you will take 40 since Shining Body will resist 20 damage, and then with Rough Seas you can heal 30 – meaning that of your 160HP (120HP base + 40HP Fighting Fury Belt) – you’ve only taken 10 damage! The deck usually runs DCE to accelerate in addition to Max Elixirs so Seismitoad-EX can benefit from these. Although both Eelektrik and Raikou are Lightning types, nothing about the Dynamotor ability states that the recipient must be Lightning type. This means that you can power up Seismitoad-EX just as easily as Raikou. The item lock of Seismitoad-EX combined with Rough Seas gives him some durability while giving you a little time to ramp up your energy and then go for knockouts with Raikou. As you can see this deck has quite a bit going on including a Keldeo-EX/Floatstone combo to help switch out a redundant ‘toad or Raikou. It is an extremely fun deck to play, and aside from the Tapu Lele-GX also quite affordable. While not as dynamic as Nightmarsh, it can provide a great challenge to top tier decks. It also is well positioned to counter Yveltal decks and emerging Ho-Oh-GX decks. If you’re thinking about getting into the Expanded Format it’s never been easier. The banlist in Pokémon TCG is mercifully short and there’s lots of people around to play against. Let us know if you have tried any of these decks. Until next time, keep being the very best – like no one ever was! *Greninja is more popular than Pikachu in Japan! Welcome again to Meta Monday. Today we’re going to look at a standard format deck type that is inexpensive to construct and is relatively strong against most other decks. The key Pokémon are Alolan Ninetales, Alolan Ninetales GX and Tapu Fini GX. Useful trainers are Aqua Patch and Guzma. This deck is a type of control deck – it aims to regulate which Pokémon your opponent has active and by dictating which of their Pokémon can attack you can then prevent them from damaging you. 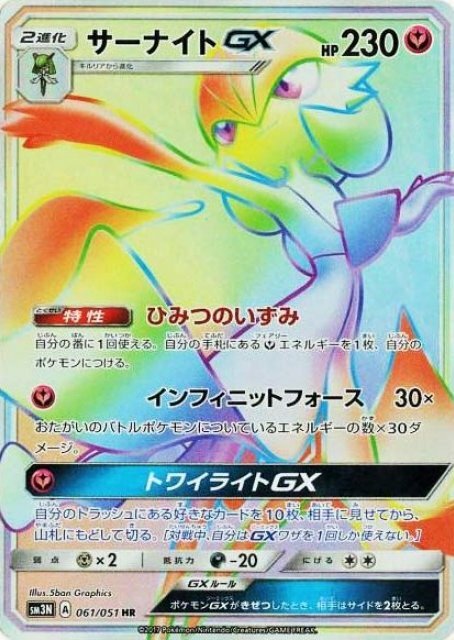 Firstly Alolan Ninetales with Luminous Barrier – this protects your Pokémon from opponents GX and EX as well as having a low retreat cost and a somewhat passable attack. The only real threat to it in the format is a steamed up Volcanion or a Metang with 3 energy that hits for weakness and can one hit KO your Ninetales. Ideally this will be your active Pokémon when your opponent is using a GX or EX Pokemon. The low damage doesn’t matter when you can’t be damaged in return, so just play it calmly and steadily. Alolan Ninetales GX – This is for when you need to hit harder or if a more significant threat needs dealing with. 210 hp is enough to survive most non-weakness hits that you can then Ice Path GX to swap the damage or use Acerola to bounce Ninetales GX removing the damage and swapping in a Luminous Barrier Ninetales. Ice Blade allows you to hit around the opponents active Pokémon targeting their bench – this is particularly useful if they have a bulky support Pokemon active or a Pokémon that has a high retreat value such as Vikivolt. In these situations you are better off leaving that non-threatening Pokémon active and targeting bigger threats on the bench. The last active Pokémon in this deck is Tapu Fini GX. This Pokémon can help you switch around with aqua ring, complements ice blade with hydro shot which can also target your opponents bench. If you’re facing a massive threat, such as a powered up Metagross GX or Gardevoir GX you can use Tapu Storm GX to shuffle them away and give you some breathing space. Timing is extremely important as you need to maximise the time it gives you to get ahead of your opponent. Don’t remove something that Luminious Barrier could be blocking unless you really need to! The rest of this deck is built around supporting these three key Pokémon and controlling the flow of the main game field. Octillery and Tapu Lele GX are for consistency, the glut of energy is to ensure that you can confidently discard with Ultra Ball to then Aqua Patch them back on to accelerate the deck. Options shown below are to switch Rescue Stretchers for Super Rods. If you find yourself running out of energy then swap in a Super Rod instead of a Rescue Stretcher. Brock’s Grit is there for mid-late game recycling too.